I bought the Destiny's Hand Omnibus on a whim last week. I was idling through a disappointing Barnes & Noble, not seeing anything remotely interesting that I didn't already have when I eventually stumbled on this. I had never heard of it, but it appeared to be a complete manga story, collecting the first two volumes of the series, plus a third that was never published before. Though I was unfamiliar with the series and all the creators involved, it looked like an old-school pirate yarn so, coupled with a relatively low price point ($14.99), I figured I'd give it a shot. The basic story is that of the gentleman pirate Captain Blaine, who takes on a young girl as his heir about the legendarily unsinkable ship Destiny's Hand. Young Olivia takes to pirating well, but she's eventually tested once Blaine receives a grave injury. He then sets her and the crew on a quest to recover and destroy The Devil's Eye, an orb of extremely powerful magic. Though the quest itself provides few obstacles, the crew of Destiny's Hand find themselves in a deadly race with not only a rival group of pirates but also the local navy. The story is pretty straightforward. You've got the old leader, mortally wounded, directing his apprentice on a quest that earns her the respect of the rest of the crew. There's a pair of potential love interests, a shady crewman to provide Olivia with some internal opposition, and the old Captain's long-time rival as the main antagonist. Nothing terribly unexpected, but it's not bad either. I was a little less taken with the artwork. It was certainly better than I could do and it was generally serviceable, but there were enough quirks with how the anatomy was depicted that didn't let it sit comfortably for me. An arm that was a tad too long, or a head that was a little too small, or some fingers that didn't grip an object quite right. Which was especially jarring because the characters' poses and stances seemed rather natural. Furthermore, despite the large cast, the characters always maintained a consistent look and were always easily identifiable. The characters never seemed stiff or expressionless, and their body language was always well-suited to the situation. It was just that things were just off enough to be uncomfortable. I was surprised that the ending did not seem rushed. Clearly, the first two volumes were produced, but sales weren't strong enough to warrant a third. I expect that they had most the third volume drawn, but decided enough time had passed since the second volume was released (two full years) that a third volume wouldn't sell unless the first two (now out of print) were also available. Hence, the omnibus edition. But the pacing seemed fairly natural, like it really was designed as a three-volume story. It may well have been, but that strikes me as tad unusual for manga. 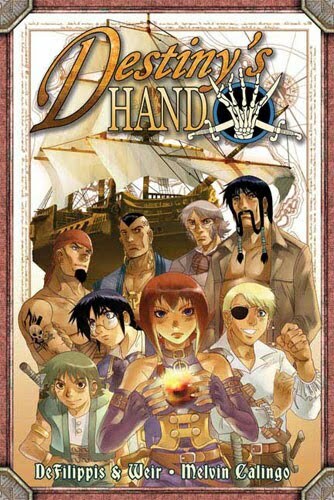 For fifteen bucks, it wasn't a bad read if you already like manga and/or pirates. I don't know that I'd recommend it to anyone, but I don't feel slighted either. Had I paid $10 three times for separate volumes, I might feel differently. It was entertaining enough, though, and had lots of pirates, so I can't complain too much.